Pittsburgh, PA (January 17, 2019) – Howard Hanna Mortgage Services has announced an exciting new program to protect homebuyers from interest rates. The exclusive Howard Hanna Mortgage Lock & Shop program gives buyers the opportunity to get pre-qualified for a mortgage and lock in a mortgage interest rate while they shop for a home. If rates go up before they find that home, the borrower’s rate stays locked. In addition to the Lock & Shop benefit of saving money should interest rates rise, buyers are pre-qualified for their mortgage. “As listings continue to be low in most of our market areas, being pre-qualified gives the buyer a needed advantage when it comes time to make an offer,” said Hanna. 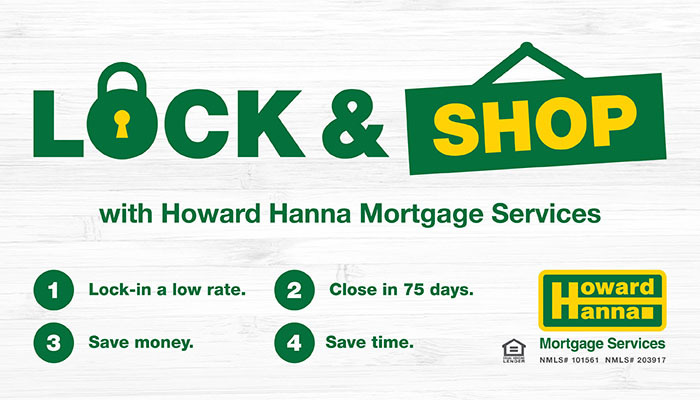 The Howard Hanna Mortgage Lock & Shop program provides rate protection of up to 75 days. Borrowers have 30 days* to find a home and execute a sales agreement and then use the remaining term of the rate lock period to close on their property. For more information on Howard Hanna Mortgage programs and Lock & Shop click here, contact your Howard Hanna agent, or visit a Howard Hanna Real Estate Services office. ***REAL Trends 500 rankings, March 2018; March 31, 2018, HIB Consulting, LLC.